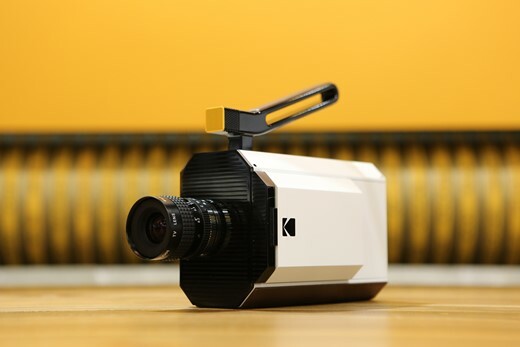 For the first time in over thirty years, Kodak has announced plans to launch a Super 8 cine camera, introducing a model that mixes analogue and digital technology. The new camera, which doesn’t appear to have a name other than Kodak Super 8 Camera, will record its movies on normal Super 8 film cartridges but will offer a digital LCD flip-out panel as viewfinder. In keep with the old slogan ‘You Press The Button, We Do The Rest’, Kodak says that cartridges will be sold with processing included and that customers will receive the film back as well as access to a scan of the film that they can download for more convenient editing. The camera comes with an integrated microphone for audio recording, and while the company hasn’t said specifically, it appears that sound is stored using SD memory cards via a slot on the camera’s rear. Super 8 film no longer comes with an audio track, so this seems the most likely solution. The camera is also equipped with three communication ports that may be used for streaming content out during recording, as well as for charging the battery. The camera will be capable of shooting at 9, 12, 18, 24 and 25 frames per second. It will come with either a Ricoh 6mm or 6-48mm lens, but its use of a C-Mount means it will be compatible with an enormous range of existing lenses. There appears to be two designs of the camera, one with retro squared edges, and one rounder and more modern-looking. Kodak currently offers three color negative Super 8 films under the Vision3 series: a 50 ISO daylight film and two tungsten emulsions rated at ISO 500 and 200. A black and white TRI-X reversal is also available. The films come in lengths of 50 feet and the cameras fit 72 frames of footage on to each foot, giving 3600 frames per cartridge. At 24 fps users will get two and half minutes of movie, and the cartridges take just a couple of seconds to exchange. The Super 8 system first went on sale in 1965 with the intention of making home movies easier to produce. The cartridge made loading the film much more convenient and less prone to jamming the camera than previous hand-threaded systems, and the cartridge could inform the camera what type of film was loaded, so amateurs made fewer mistakes. Sound recording came in 1973 when a magnetic strip was introduced, but it was phased out again in 1997 as the substance used to bond the strip to the film was hazardous. With its recording strips and automated cartridges the APS film system borrowed much from the ideals of Super 8, and this half digital, half film camera might remind us of Kodak’s Advantix Preview APS camera that recorded images on film but showed a digital preview on the rear screen. Kodak hasn’t announced officially how much the new camera will be, but the company’s chief executive, Jeff Clarke, is quoted in the Wall Street Journal Digits blog as saying that it will arrive in fall 2016 and will cost between $400 and $750. The film should cost between $50 to $75 per cartridge, including processing. He also says a lower-cost model will emerge in 2017. For more information visit the Kodak website.